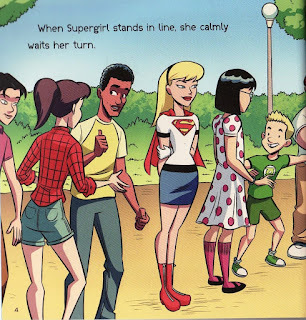 Supergirl calmly waits her turn in line. I'm the guy sometimes tapping his feet in the coffee shop line or wondering what is taking so long at the supermarket checkout. I should just let things happen as they unfold. 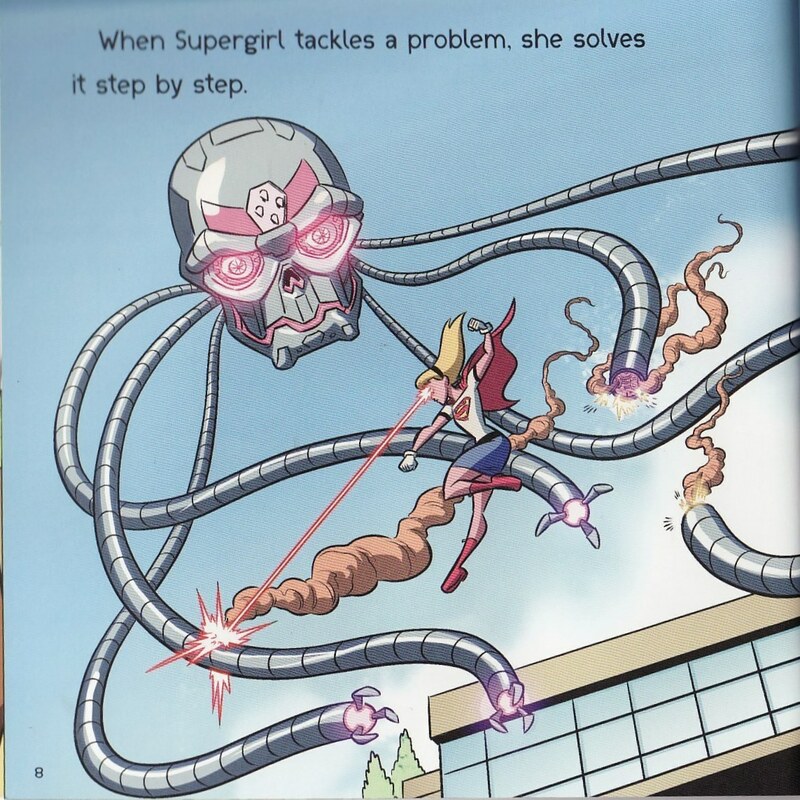 When Supergirl tackles a problem, she solves it step by step. This one I actually live daily. 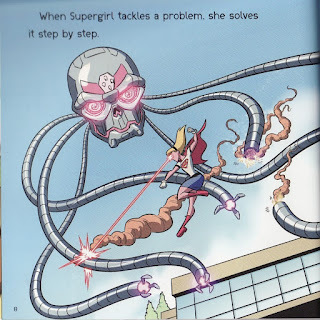 Still, it is cool to see Supergirl and me sharing an approach to problems. 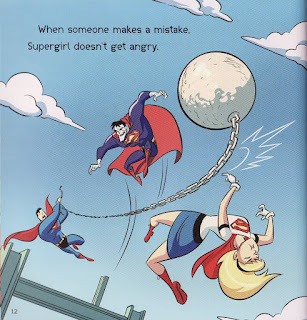 When someone makes a mistake, Supergirl doesn't get angry. I love the sheepish look on Superman's face as he clocks his cousin with a wrecking ball. I don't get angry. Maybe aggravated is a better term ... occasionally. But Supergirl doesn't get angry, instead she helps! When something slows her down, Supergirl doesn't get upset. This is similar to the waiting in line page but struck a bit more to home. As someone who struggles in a tireless, emotionally crushing commute daily, anything slowing me down can light the fuse. I should just enjoy my podcasts and be thankful for my progress. 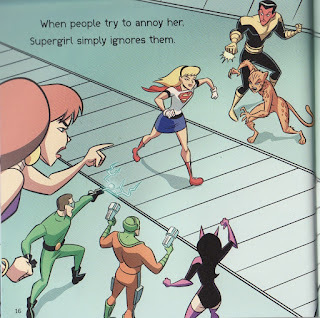 And Supergirl annoys people who are trying to annoy her. I got this one down pat. Anyways, I absolutely LOOOOOVVVED this book. I need to be more patient. Supergirl is my hero. So this was a perfect fit! "He needs to learn from his heroes." Most people don't do, sadly. Hence, the number of Superman fanboys who declared Superman had been ruined because he said his cousin was better than him. Every Superman comic version has praised his cousin multiple times -funny how they claim to be Superman fans but they are unaware of this fact-, and neither he nor Supergirl care for bruised egos, but you explain that to fanboys. That children book looks real delightful. 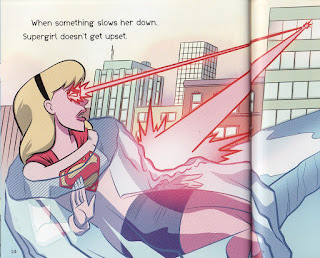 I find interesting Supergirl is wearing a version of Kara In-Ze's costume. Superman: TAS ended in 2000 and DCAU Kara's last appearance was in 2006, but the DCAU still influences things. "As someone who struggles in a tireless, emotionally crushing commute daily, anything slowing me down can light the fuse." I can relate. I can definitely relate. Regarding the last page I recognize Sinestro, Cheetah, Giganta, Star Sapphire and Riddler, but who is the dual-wielding guy? And once again we can't have even one Supergirl's enemy. It's too much to ask for, apparently. That looks like Mirror Master. And I think "the Riddler" is The Weather Wizard. Anj needs to not talk about himself in the third person because he implies that he is likely a supervillain (ducks!). 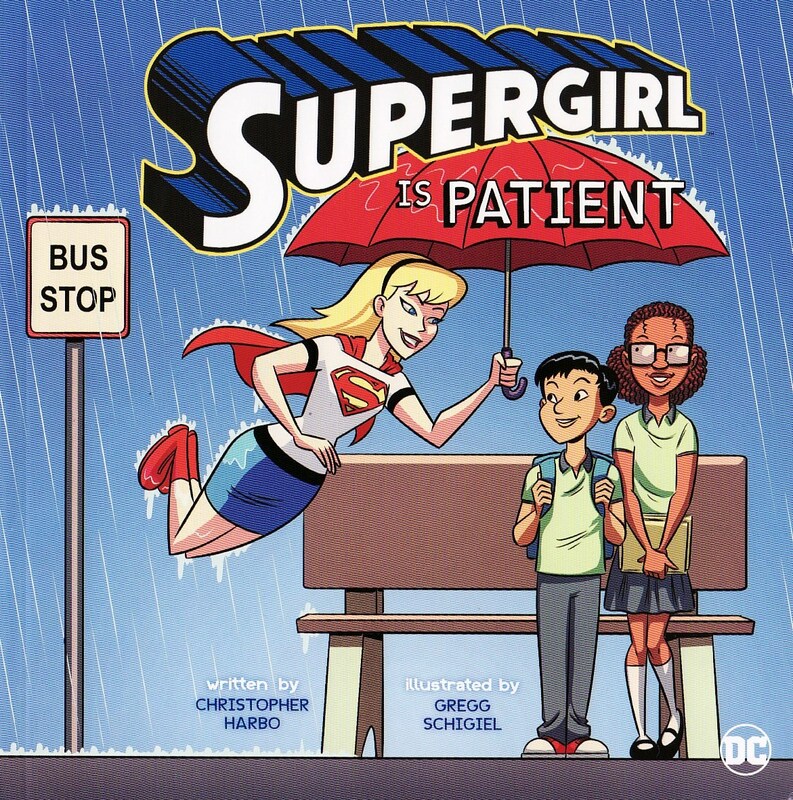 In general, the book sounds great, but boy, it's making Kara seem like a saint... I'd add a page pointing out that even a Supergirl can get annoyed or impatient with people, but she always apologies and tries really hard to be better. Lovely book. Goes on my shopping list! Thanks for sharing. And I sadly agree with anon1. As a part of the Superman fandom as well it hurts to see that the community's loudest voices are the intolerant hateful ones. I try to be a voice against that hate when I can but it feels like the few voices who try are barely static against the rumble of intolerance. I feel so disillusioned with the Superman community at the moment. Even if the community is generally good and there are just a few bad seeds who are really loud, I would have expected a community looking up to Superman to be a loud unanimous voice against the hate. Sadly, it is not. This is the only Supergirl site I visit and – with an occasional exception – it’s a really happy place. Great host, great posters. There are grumpy people everywhere, let’s leave even news of them over in their own grim spaces! They’re not bringing me down - Supergirl would find her joy! Interesting look that I've never seen before. White leotard, blue skirt. I would like to make a suggestion to some...please stop actively visiting sites that upset you. I visit only a handful of sites and they're all great with minimal negativity, aside from an occasional troll who has been visiting our poor host And re the TV show. This site, Martin's, legion of super bloggers and collected editions are all lovely sites that requires no handwringing afterwards. Don't let the negative Nellys get to you and don't visit sites that you know will upset. Life's too short. Enjoy the Super Family and other like minded fans. I promise I'm not trying to be condesending, just want my fellow fans to be happy! Good to see that Supergirl is setting a good example for others to follow. However, got to agree with Martin about adding a page which makes her a little less saintly and infallible, and more human. That would make the book just about perfect, IMO. DC Fandom Wiki message boards are generally chill. Discussions are civil, people are capable of disagreeing politely and trolls are usually dealed with. I recommend them. I try my best to keep this place an uplifting experience while also giving space to critique. Thank you for compliments. I'll try not to use the third person. I don't want to become a bad guy. And yes, the 'real' Kara can lose her temper and be fierce. 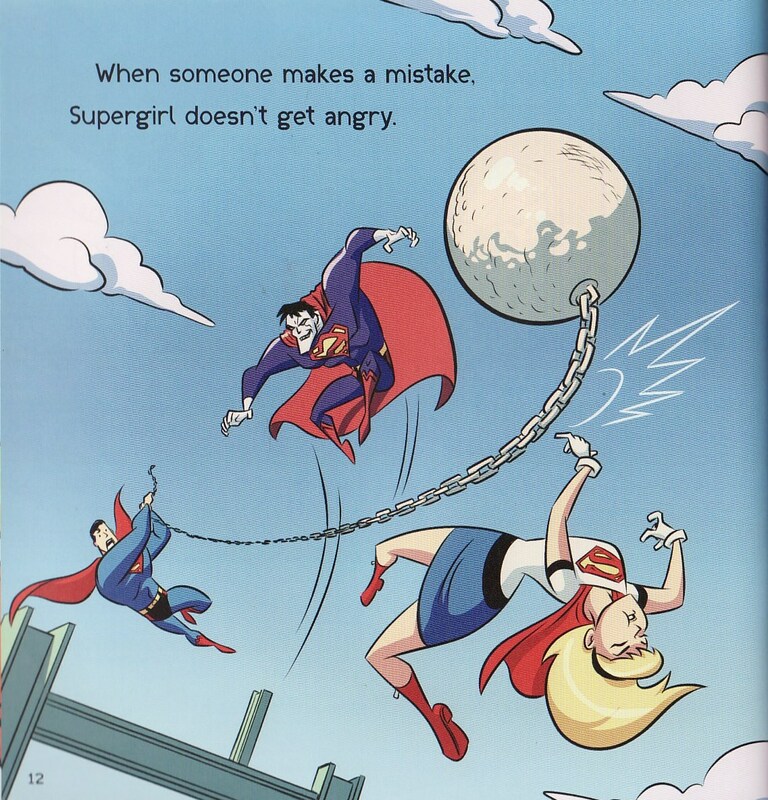 But for a book aimed to teach kids a lesson, I don't mind a purer Supergirl. Thinking on, I reckon you'd make a rather magnificent supervillain, clad in a Sonar-style outfit in your team colours. Oh go on! And I didn't want Kara to go all hell on wheels, just be mildly irked and rise above it! Oh and the SupermanHomepage....I go there, just to watch the Haters Fume Impotently. Be nice. Be better. Set a good example.